Khar has a new Asian eatery LMNOPQ, and contrary to what we may have you believe, it’s not about learning the alphabet, but about Asian cuisine. 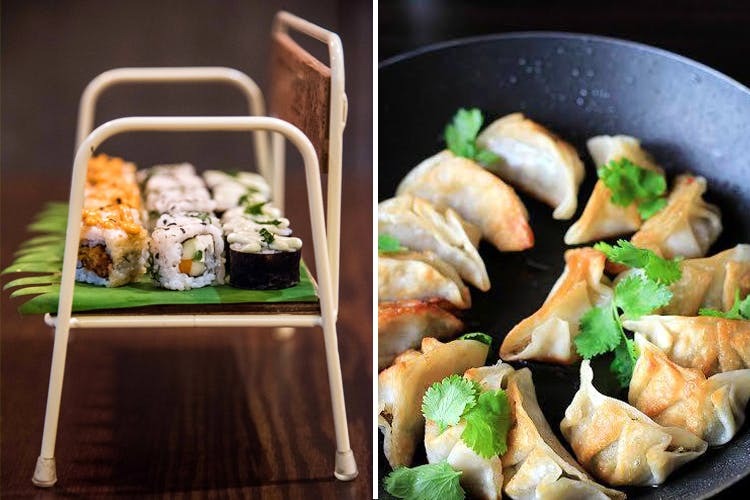 LMNOPQ is a cutesy eatery on Khar, with an overtly obvious “Oriental” decor. Massive murals of Asian ladies, with parasols are hung around the restaurant. It’s colourful, almost to the point of being as colourful as a kindergarten school. The menu is the typical sushi, bao and khow suey. The baos, the chili basil chicken and the spicy cottage cheese bird chili come out with flying colours. They offer sushi, tempura, prawns and other fusion Asian dishes. For desserts, we say order in the Nutella and peanut pie, and the Nutella salt sea cookies for some lovely sweet offerings. They offer the regular shakes, iced teas and sodas. But in addition to this, they also have a wine selection, with white and red sangrias. Another one to add to Khar and Bandra’s diverse subarban eateries, LMNOPQ is our another option for some good old khow suey and sushi.